« How Arsenal won the League for the very first time. This series is currently being updated ahead of its publication as a book on Kindle. With two games in hand over their only serious rival – Aston Villa – and a three points lead plus a much better goal average, the only way for Villa to catch Arsenal was to beat them in the match at Villa Park half way through the month (which would narrow the gap to one point), and hope that Arsenal lost both their games in hand, and one more, while Villa kept winning. And although that seemed unlikely in the context of the season, Arsenal also had to play third placed Sheffield Wednesday during the month, so there were doubters, not least because Arsenal had never won the league before, and had just one FA Cup to their name. Villa had won the League six times (although not for 20 years), and won the FA Cup six times. Arsenal, it was being said, lacked the experience of winning (although Chapman certainly had it). In the national news, there was some hope that the long running disputes between the United Kingdom and its colony India, might come to an end as Mahatma Gandhi and Viceroy of India Lord Irwin signed an agreement to end the Indian civil disobedience campaign. In return, citizens along the coast were allowed to make their own salt (which seems a strange concession, but was fundamental), all political prisoners were given amnesty and a second Round Table Conference on the matter of Indian independence would be held in London on March 29. However later in the month the Indian National Congress unanimously voted to accept nothing short of complete independence. Back with the football Arsenal unexpectedly started the month playing out a 0-0 draw with Huddersfield on 7 March. The Arsenal team for the match however was disrupted from its tried and tested line up. Eddie Hapgood missed only his second game of the season at left back giving Alf Baker his one and only game of the season – it was in fact his final game for the club. Baker played 310 games for Arsenal all told – his only senior club – and went on to become a scout for the team. Bob John was out for the first time in the season, replaced by George Male (who would have to wait until 1932/3 to give his big chance, long term). Jack Lambert was also out – for the fifth, but thankfully last, match in a row, which meant that the dependable but now ageing Jimmy Brain continued his run at inside right. The focus of the game was on ensuring the re-worked defence held firm, everyone played deeper, and a goalless draw it was. Matters improved in the rearranged mid-week match at Elland Road where Arsenal won 1-2, Bastin and James getting the goals. Len Thompson came in for the first of two consecutive games at left half, with Bob John still absent, while Male moved across to replace Baker who had not impressed at left back against Huddersfield. Jack dropped out and Lambert finally returned. The line up meant Arsenal still had seven members of the team that started the season playing in this game, and it worked, but only just. Which thus gave the club some worries for the big match the following Saturday away against Villa. The 1-5 defeat in this game, the worst of the season, didn’t take Villa to the top of the league but it must have given them hope. And it certainly shook Arsenal although it was however Arsenal’s only defeat in the last 19 games of the season. Chapman was clearly still looking for ways of patching up the injured team, and this time put Bob John in as left back. John had played there before – but only twice in the previous season. Lambert was out yet again – his comeback having lasted just one game. Thompson continued at left half – but it meant that down the left side of the defence both the key players were missing. Their replacements were not bad players, but this was the match that Villa knew they had to win, and they knew where the weakness was. Jack got Arsenal’s goal. But Chapman’s view of the game was also clear: not for the first time the goalkeeper was to blame. Having played 10 consecutive games, Preedy was dropped, and Harper came back for the rest of the season. There was no respite of course because the following game was at home to the third placed club: Sheffield Wednesday. Another defeat would leave Arsenal vulnerable as their precious games in hand would have gone. 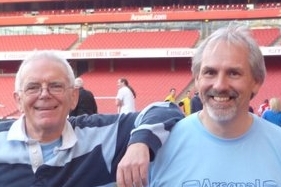 This game marked Jimmy Brain’s final appearance for Arsenal. He played 204 league games and scored 125 goals. He left Arsenal for Tottenham for £2,500 in September and played 45 league games for them, before moving on to Swansea, Bristol City and Cheltenham, and then later managing in non-league football. But back with the Arsenal, the club were however rescued by the fact that much of the original team – the team that clearly could play the Chapman system so well together, were back. There were changes of course: Hulme, the outside right was injured and was replaced by Jack moving across from centre forward. Lambert came back as number 9 and Brain continued as inside right. But it meant that the original defence (Parker, Hapgood, Jones, Roberts, John) were back together the first time in four games – and with no one playing out of position. The result was a 2-0 victory, with Jack and Bastin scoring. And as the evening papers rolled off the press, there was another piece of good news. Aston Villa had been held 1-1 away to Derby. Arsenal’s lead was extended. That must have been a huge relief to everyone, as was the fact that the last game of the month (on 28 March) meant Arsenal were at mid-table Middlesbrough, where a comfortable 2-5 victory put Arsenal back in the driving seat. Alf Haynes came in for his first of two games for the season, in place of Roberts (who was winning his only cap for England at the time), but otherwise it was business as usual. Best of all Lambert was back, and he marked his return with a hattrick. Jack got the other two. But Villa had not given up, and on the same day Aston Villa beat Blackpool 4-1. Nothing in this most exciting of seasons was the slightest bit certain. AC is the average crowd for the home team through the season, providing a comparison between the crowd on that day and and the norm expected by the home side. The lowness of the Leeds crowd can be explained by it being a mid-week match and by the team looking likely to drop to the second division. Otherwise all the crowds were all above average – Villa in fact getting almost double their normal crowd. Tottenham meanwhile were still holding on for glory of their own in the second division, being second, three points above West Brom in third, who also had a game in hand. The Arsenal defeat at Villa turned out to be Arsenal’s last defeat of the season. Here’s the full table for the end of the month.